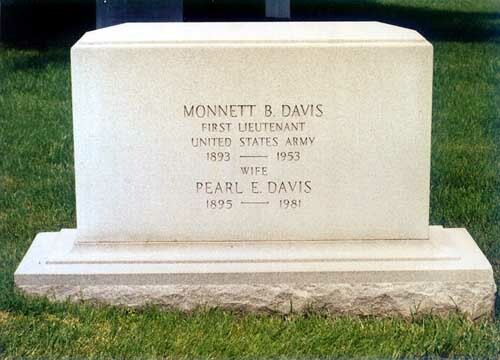 Monnett Bain Davis (August 13 1893-December 26 1953) was an American Ambassador. Born in Greencastle, Indiana, he was named for his maternal grandmother, Mary Monnett Bain, a benfactress of the Ohio Wesleyan University in Delaware, Ohio. During World War I, he served in the American Expeditionary Force (AEF) in the United States Army in World War I. He later entered into the United States Foreign Service and served three tours of duty representing American interests abroad. Following service to the U.S. Embassy in Denmark, Davis was given his assignment as United States Ambassador to Panama (1945-1946). Recognized for his negotiating skills, Davis was then assigned to the post of U.S. Ambassador to Israel in 1951. 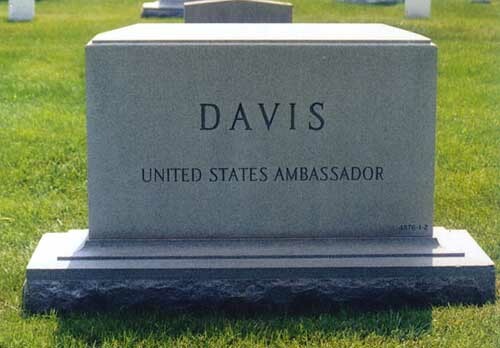 Ambassador Davis died in his sleep in the United States Embassy in Tel Aviv on December 26, 1953. His body was returned to the United States and interred at Arlington National Cemetery. Monnett Bain Davis (1893-1953) of Colorado. Born in Greencastle, Indiana, August 13, 1893. Served in the U.S. Army during World War I; Foreign Service officer; U.S. Minister to Denmark, 1945-46; U.S. Ambassador to Panama, 1948-51; U.S. Ambassador to Israel, 1951-53. Died in Israel, December 26, 1953. Buried In Section 2, Grave 4876, Arlington National Cemetery. He is buried adjacenet to Richmond Pearson Davis, Major General, United States Army (June 23, 1866-September 15, 1937).